This is what you have been wating for! 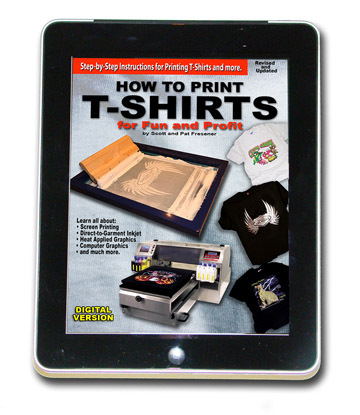 If you are starting out or already print shirts you need this book. For a limited time this book is being offered for FREE! Simply use Coupon Code HTPFREE when you order and the invoice is zeroed out and you get an immediate download link! We have updated our book with a lot of new information, current trends, procedure updates, over 150 new photos, updated Buyer's Guide and much more. Over the years we have worked hard to keep How To Print T-Shirts For Fun And Profit the most current book available in this industry. This is the same great book that is the standard reference in the industry but it is now an interactive PDF for your computer, tablet or smart phone! You get the entire How To Print T-Shirts book with forty videos (2.5 gigs!) on all key topics. The movies stream instantly from our high-speed internet server. Watching and reading the book on your computer, tablet or phone is a thing of beauty! This book covers everything from A to Z about screen printing T-Shirts and Heat Transfers, and includes sections on printing Nylon Jackets, Baseball Caps and more. Plus, it has a new expanded section on digital heat transfers and direct-to-garment inkjet printing on shirts. This is the book the industry talks about. It is responsible for getting thousands of T-Shirt printers into the profitable garment printing business! Every successful shop has a "well used" copy of this book. How To Print T-Shirts For Fun And Profit has literally become "the Bible" of the industry. It is written in an easy-to-follow step-by-step manner by industry experts Scott and Pat Fresener who have been in the industry since 1970. This digital version is an interactive PDF file. The download file that is 35mb in size. After you have paid for the order you will receive a download link. Simply unZip the file, read the Read Me file and copy the book to your computer, tablet or phone. 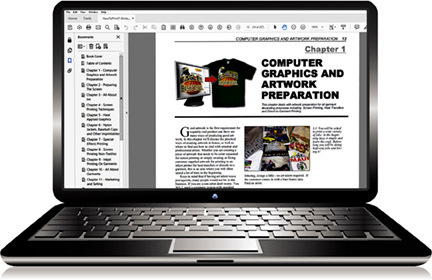 You will need a copy of Adobe Acrobat and/or an Acrobat or PDF reader. If you have any problems with the download send email to support@tbiznetwork.com and we will send you a direct link. • Complete Suppliers Directory With Over 400 Listings. • Over 20 Wall Charts and Ready-To-Use Forms. • Plans To Build Your Own Equipment. • Over 350 Photographs and Illustrations. • New Chapter on Direct-to-Garment Inkjet Printing. 16. Wall Charts and Forms. This ebook is pure gold. There's so much useful information in here that I wish I knew when I first started out, and I'm glad I've read it now 2 years in to my business. and not years down the line. Saying that, I think this book could prove useful for literally anyone in the industry, those just starting out and the veterans. Scott's wealth of knowledge gained from such a long time in the industry really is worth it's weight in gold. You can't really put a price on it. Yet here it all is, in one handy ebook. Thanks Scott, you the man! This book is packed full of valuable information and is a must have for anyone thinking of getting into the garment printing business.